In May ago I did my usual two night run at Brighton Fringe to two lovely sold out rooms at the fabulous Marlborough Theatre (thanks Tarik & David). The new show, I Can Make You Feel Good went really well, thanks for asking. Afterward, the lovely Stuart Turner asked me to come down and do a short spot at the late night variety show he was running at The Caroline of Brunswick. The Caroline is an odd venue. 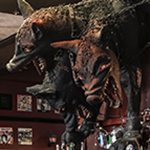 Downstairs its a full on Metal Bar with Candle of Filth pumping out and various Goth/Metal paraphernalia on display including a giant, LED eyed, Cerberus hanging from the ceiling. Upstairs the performance room is grubby, tiny, has no stage, no backdrop nothing. 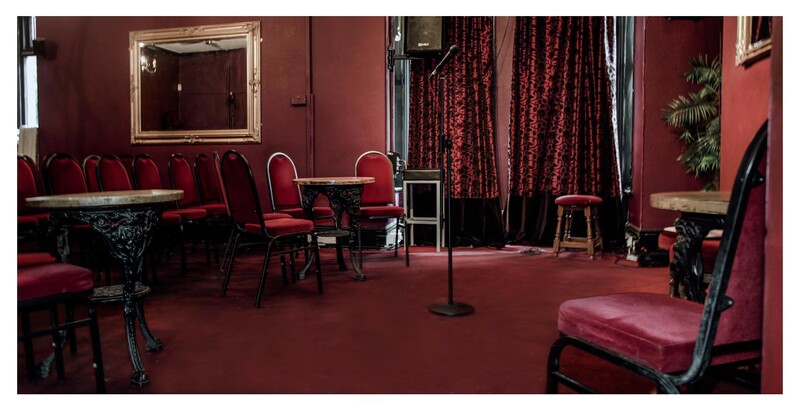 Despite this it is a venue beloved by comedy acts and has hosted shows by people like Rhod Gilbert, Jon Richardson, Josie Long, Richard Herring, Sara Pascoe, Romesh Ranganathan, Joe Wilkinson, Isy Suttie, Katherine Ryan and Josh Widdicombe. Just over the next few weeks you can see Lucy Porter, Zoe Lyons, James Acaster, Max & Ivan, Joel Dommett & Carl Donnelly in this grubby little room. I’ve always loved playing there. Stuart filmed the entire gig on his little camcorder and I’m delighted to be able to show you some highlights from my set.